Douarnenez is a well known tourist resort on the coast of Brittany. From the town centre travel south in the direction of Quimper. 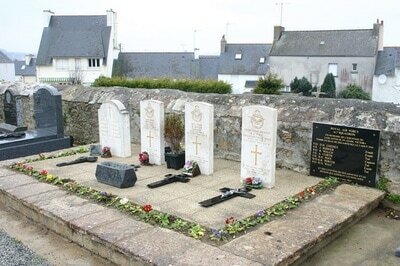 The communal cemetery will be found near the church of Ploare - a church easy to find as the steeple is very high. 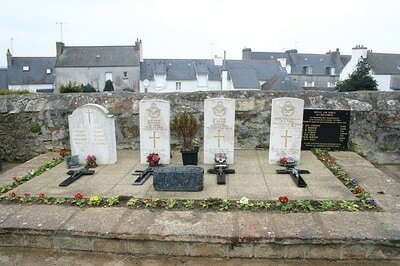 At the lower right section of the cemetery, within a kerbed area against the wall, are the 3 Commonwealth war graves and a memorial to four French war casualties. 1382229 Flight Sergeant Reginald Howard Pool, Wireless Operator/Air Gunner in 617 Squadron, Royal Air Force Volunteer Reserve, died 5th August 1944, aged 21. Son of Reginald Kingsley Pool and Rose Mabel Pool, of Hornsey, Middlesex. 178240 Pilot Officer William Noel Wait, Air Gunner in 617 Squadron, Royal Air Force Volunteer Reserve, died 5th August 1944, aged 21. Son of William Arthur and Winifred Florence Wait, of Lichfield, Staffordshire. 175644 Pilot Officer Robert Welch, Navigator in 617 Squadron, Royal Air Force Volunteer Reserve, died 5th August 1944, aged 21. Son of William Turnbull Welch and Isabel Welch, of Greenock, Renfrewshire.